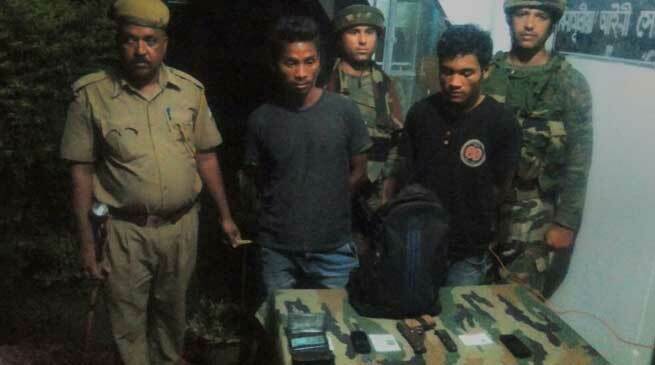 Army apprehended two Linkmen of Garo National Liberation Army ( GNLA ) from Dhubri district on May 31. On the basis of a specific information, Army launched a joint operation with Assam Police in general area of Hatogaon in Dhubri District on 31 May. The party established a Mobile Check Post on road Hatogaon-Lakhipur and stopped a suspected pick up vehicle. On carrying out search of the vehicle, two GNLA linkmen were apprehended. The apprehended persons identified as Julius Sangma and Malceng Marak. One Pistol with magazine, two mobile phones and seven SIM cards were recovered from the apprehended linkmen.